FBS COMPANY: WE WILL MAKE YOUR DREAMS COME TRUE! The exclusive promotion from the FBS Forex broker – FBS makes your dreams come true! – is getting more and more feedback in the social media. The contest is open to all company’s clients. The prize is as much as fulfillment of the winner’s most cherished dream! New Year and Christmas season is the most magical time when your wildest dreams can come true. 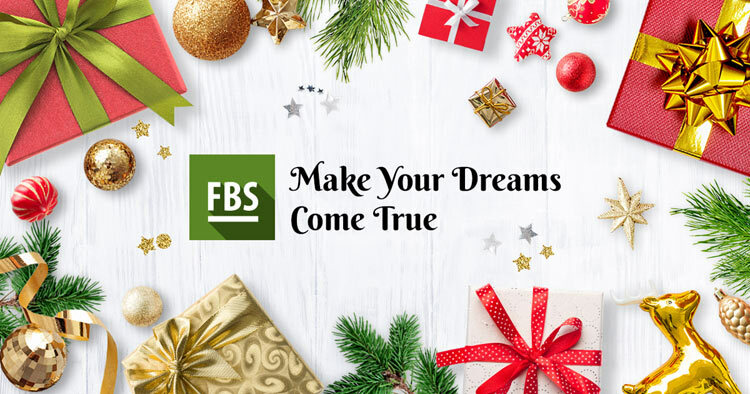 Here is one sure way to fulfill your long cherished wishes – participate in the promotion from the FBS Forex Broker: FBS makes your dreams come true! We have already mentioned some FBS promotions for traders, but the contest FBS makes your dreams come true! certainly deserves to be discussed separately. It might be the most fantastic and mind-blowing promotion for traders all over the world. And it is not surprising as the main prize is fulfillment of their most cherished dream! The FBS Forex broker has been operating in the international market since 2009. The company is now represented in more than 120 countries around the world, the number of FBS traders exceeded 2 million, and the number of its partners is over 130,000 people. More than 600 trading and partner accounts are opened with FBS daily. The company’s clients earn more than $500,000,000 a year. So far FBS Company has won over 35 international awards. More than 2 million traders are already trading, earning money and fulfilling their dreams with FBS, so the company decided to launch the promotion, where the winner will get their most cherished dream come true. Register an account with FBS (if you don’t have it yet) on the website fbs.com and link it to your Facebook page. Share your dream on the official FBS page in the social network (in comments to the post about the launch of the next cycle of the contest). Make a repost of the contest*. * You can find the detailed step by step guide for participation in the contest FBS makes your dreams come true! on the company’s website under “Promotions“. The winner is determined in two stages. 100 participants whose comments have generated the most likes are shortlisted for the final. Then, FBS employees choose the most creative, unusual, kind, bold and touching wish out of this hundred. And – as if by magic – this wish comes true! It is important to note that according to the terms of the promotion FBS makes your dreams come true! money cannot be the prize: here at FBS we believe that money itself is not a dream but rather a means to achieve it. They believed in their dream – and they won! Mohammed Ashrey from Egypt wanted to become a professional trader and a Forex expert. FBS has granted him a scholarship at one of the most prestigious trading schools in the Middle East.With the help of this knowledge, Mohammed can fulfill nearly all his dreams himself. Steven Than Lvorm from Indonesia had long wanted to get a powerful laptop, and the company was glad to help him. He became the owner of a new ASUS Transformer Book, and as a bonus he also received a T-shirt signed by the FBS CEO for inspiration and further successes in trading. Junet Keren asked the company for a LG G5 to enjoy all the benefits of mobile trading, and he also wanted to get four branded T-shirts for doing sports with his family. And FBS was happy to make his dream come true. And this is just the beginning. Every month there is a new cycle of the contest. Every month there is a new winner, and one more dream comes true. It would seem that Forex, where figures decide everything, is completely devoid of romance. However, FBS believes that dreams are moving forward this world and help traders perform miracles in the Forex market. Here at FBS we are constantly working on improving the quality of our services. We want every trader to be able to satisfy their trading needs. Not only are we improving services in each country where we work: we conduct researches, open new offices, connect payment systems, and expand customer support staff, etc. We strive to get to know each of our clients as much as possible, to understand what they need, how they live, and what they dream about. And thus we came up with the idea of the contest FBS makes your dreams come true! Now we can safely say that the result exceeded all our expectations. The contest brings a lot of positive emotions to both our clients and us – the FBS staff, and this helps traders trade more successfully, as well as encourages us to improve our services for trading. In addition, our clients are now firmly aware that all their dreams can come true thanks to FBS! Are you taking part in the magical contest from FBS yet? Do not miss your chance! Dreams should come true – and FBS company is willing to be a good wizard for you. Participate in the contest FBS makes your dreams come true! However, there is one more opportunity to fulfill your dreams. Forex trading provides endless possibilities for that. And for those who are ready to take their destiny into their own hands, FBS offers perfect trading conditions, high quality service, and attractive promotions for beginners and pros. Dreams come true for those who work hard towards their fulfillment!